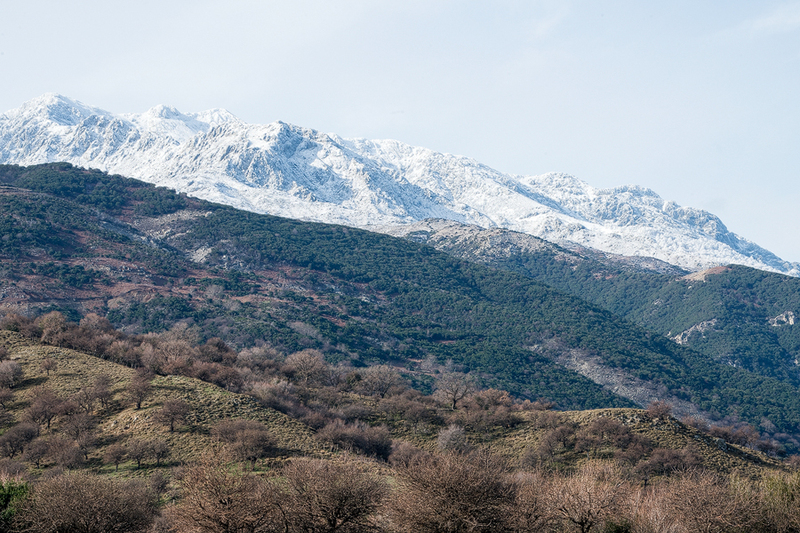 I spent a few days on Samothraki, a mountainous and beautiful island in the NE corner of the Aegean, between 18 and 21 January. I was there to study a recently described snowdrop species (Tan et al. 2014*), imaginatively named G. samothracicus, which is morphologically similar to G. nivalis but apparently distinct from it. A large population of Galanthus samothracicus just starting to flower near Ano Meria, Samothraki, 20/1/16. There is much to be said about the status of this putative new species but I recognise that the more arcane aspects of this discussion will be interesting to very few. I’ve therefore relegated the discussion to the end of this post and below I simply report my observations on the wild populations I saw, for what they are worth. Layers of vegetation at various elevations on Samothraki. The rocks on Samothraki are a mixture of igneous granites and metamorphic schists, with some chunks of limestone thrown in for good measure. The highest peak on the island, Saos, is 1611m tall, the tallest mountain in the Aegean, if you exclude Evia (Euboea) and Crete. 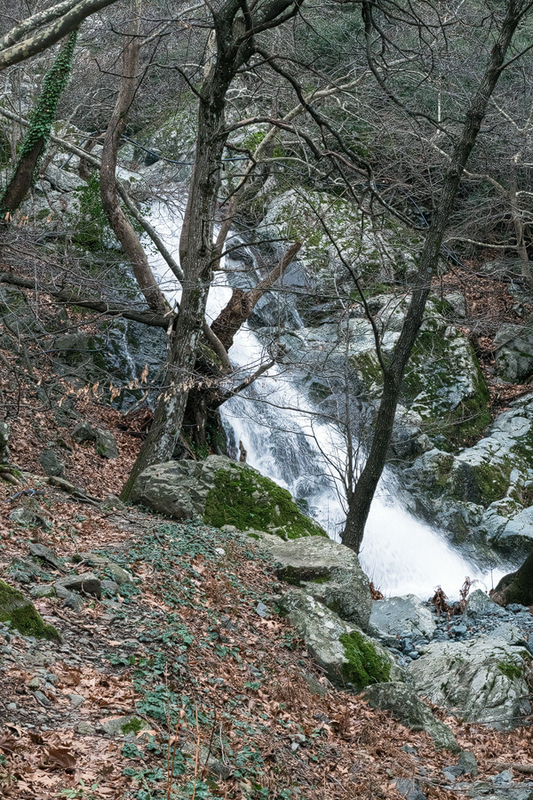 The slopes of the mountains are very steep and the numerous streams that flow off them cascade over spectacular waterfalls for much of their length. At the base of the mountains, however, is a wide ‘skirt’ of gently sloping, fertile land, on which all the island’s habitation and agriculture is crowded. The streams flow in wide, meandering, rocky beds across this flat area. 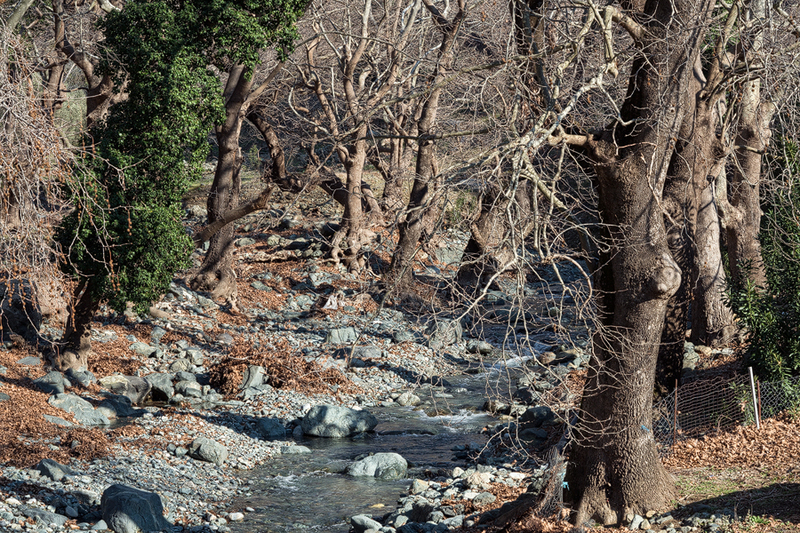 Plane trees lining the wide, boulder-strewn bed of the Xiropotamos River. Plane trees, especially in the north and east of the island, form large, open woodlands over seasonally flooded or very wet forest. At higher elevations, the increasingly steep slopes are covered with a mixture of evergreen and deciduous oaks and maples, and conifers come in to the mix higher still. 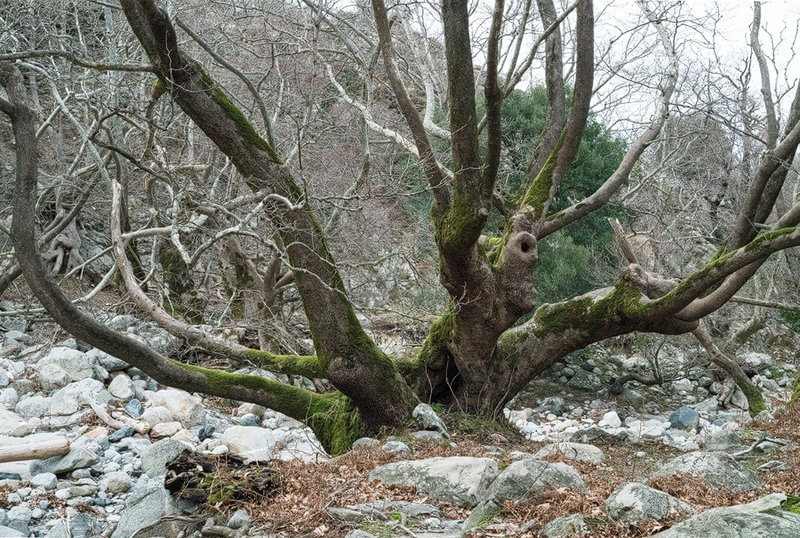 Plane Tree on the banks of the Fonias River, Samothraki. 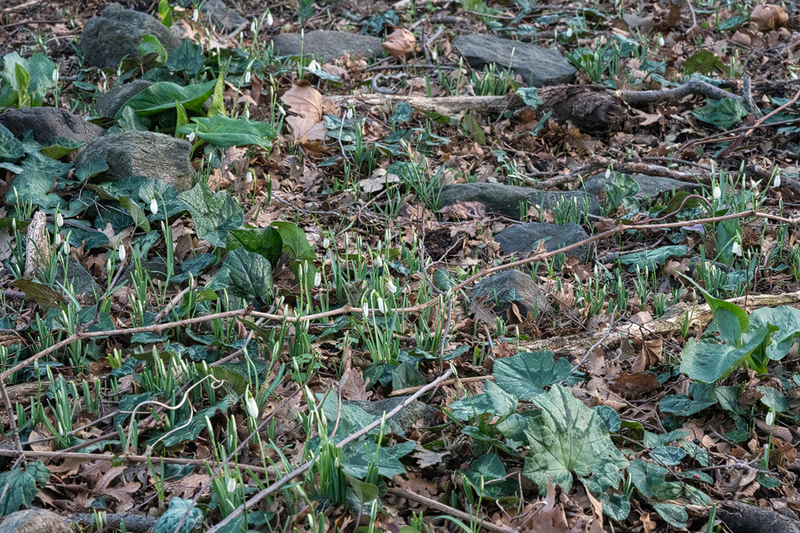 The snowdrops occur not on the relatively rare limestone, as one might expect, but in sandy and gravelly soil, along rivers and in wooded pastures, with granite and schist boulders. 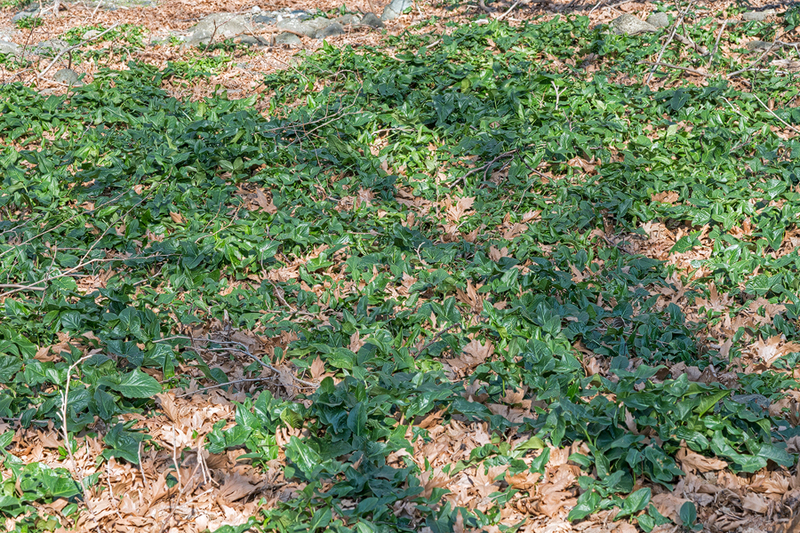 The soil is much enriched by leaf litter. Tan et al. report a maximum elevation of 100m for G. samothracicus but I found two populations at 135m. Above this elevation, the slopes become rapidly steeper and it is possible that there is no suitable habitat for snowdrops at higher elevations but I would like to spend longer exploring higher on the mountains to be sure. 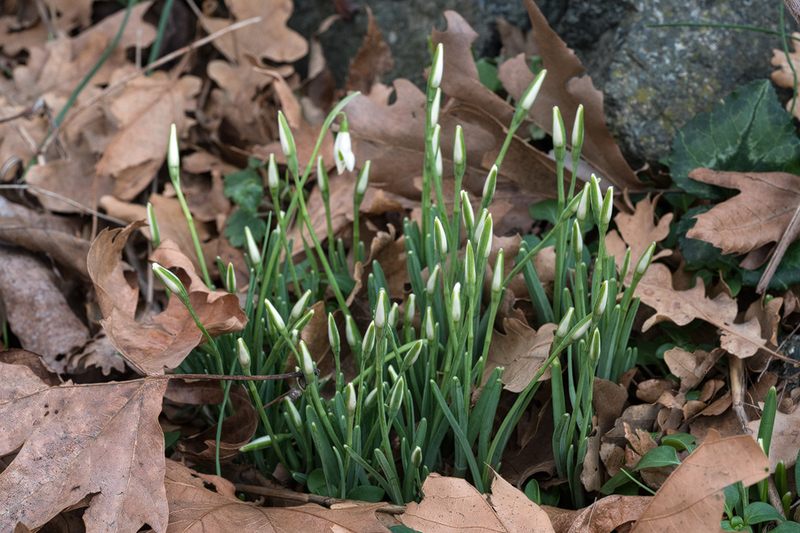 Thousands of snowdrops were poised to emerge under the leaf litter near Therma, Samothraki, 18/1/16. I stayed on the north coast, at the village of Therma, which is named for the hot springs that emerge from the base of the high mountains that dominate the island’s topography. Tan et al. (2014) report that G. samothracicus flowers between January and February in the wild and that it is abundant in several locations around Therma from sea level to at least 80m. I was puzzled initially, therefore, that I couldn’t see any snowdrops at all. 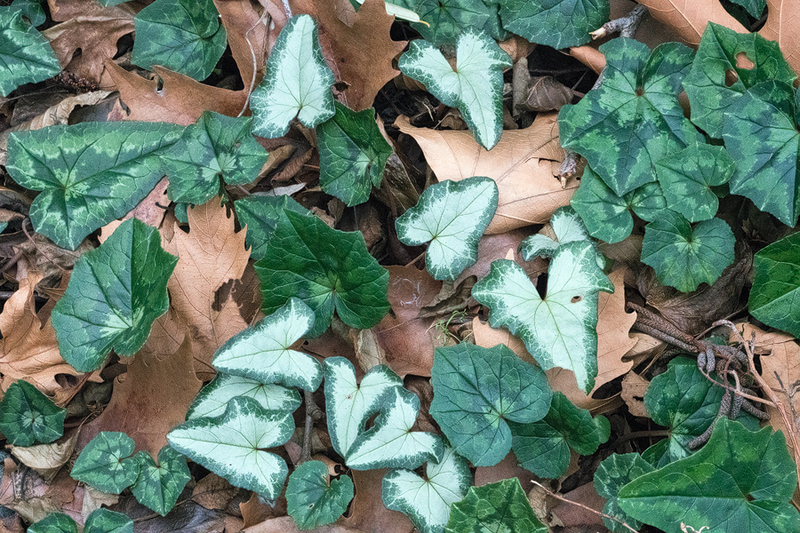 Cyclamen hederifolium was abundant, finished flowering but with wonderfully variable leaves, and an Arum species (possibly A. elongatum) was thrusting up through the plane leaf litter. There was no sign of snowdrops. 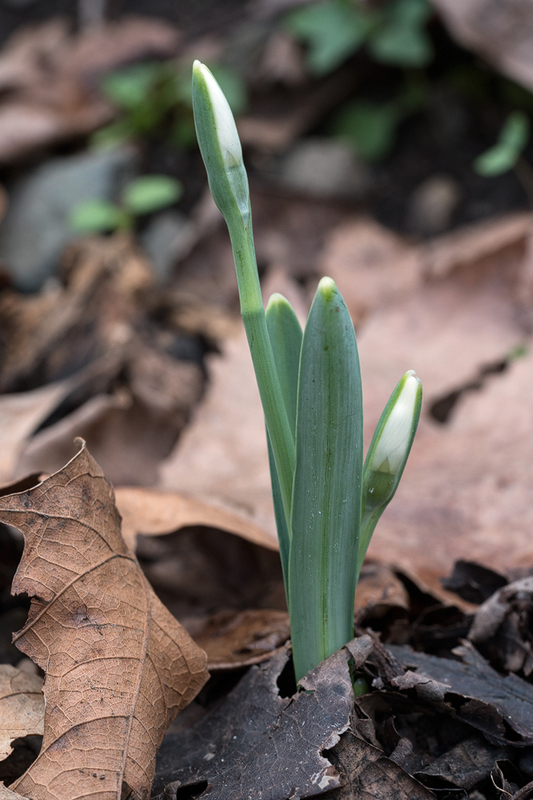 Eventually I scraped away a bit of the leaf litter with my toe and there were the snowdrops, all still below the leaves but above ground, waiting for warmer weather (the daytime temperature had hovered around freezing for the preceding few days). It seemed, again, I’d come too soon. Cyclamen hederifolium, Therma, Samothraki, 18/1/16. Arum sp. emerging, Xiropotamos River, 19/1/16. The following day was sunny, though still cold, and I decided to investigate the Xiropotamos river, in the south of the island, where Tan et al. had reported another series of populations. Again, though there seemed to be plenty of good habitat, there were no snowdrops visible until I came across a small patch of them just starting to flower, under plane trees at the base of a steep, west-facing bank. Quite why this little group, all within 10m of one another, had emerged earlier than the rest of the population, I do not know. Galanthus samothracicus, just starting to flower, Xiropotamos River, Samothraki, 19/1/16. The flowers at this site were all tightly closed in the cold air and the plants few, so I decided to move on a third site, the village of Ano Meria, in the east of the island. Here, at an elevation of 135m, I found two populations, the largest of which comprised several thousand plants and occupied about a quarter of a hectare at the edge of a fenced pasture under predominantly deciduous oak trees. The smaller population was also flowering at the margins of a field, again with shade from deciduous trees. Although these populations were also in the very early stages of flowering, with most clumps barely emerging, they were well ahead of the lower elevation population near Xiropotamos (80m) and even further ahead of those at Therma (sea level to about 50m). Galanthus samothracicus, near Ano Meria, Samothraki, 19/1/16. The first thing that struck me about the snowdrops was their small stature. Granted, they were still in the process of emerging but none of the scapes were more than 13cm tall and many were shorter than 10cm. The flowers were positively diminutive. The outer segments ranged between 14mm and 21mm in length in a small sample I measured. The inner segments of the same sample varied from 8mm to 11mm. These measurements are within the range reported by Aaron Davis for G. nivalis, but definitely on the dainty side. Blue-glaucous leaves of Galanthus samothracicus, near Ano Meria, Samothraki, 19/1/16. The leaves were conspicuously blue-glaucous, erect at first but soon spreading, with linear sides and decidedly blunt (obtuse) tips. An inconspicuous paler stripe was visible in many cases down the middle of the adaxial (upper) surface. The vernation was unambiguously applanate in all cases. Applanate vernation, flat leaf margins and tips, slight pale median strip. Galanthus samothracicus, Xiropotamos River, Samothraki, 19/1/16. The leaf margins and tips were typically absolutely flat, whereas in G. nivalis they are often slightly revolute, especially at the leaf bases. The abaxial (lower) surfaces were slightly longitudinally grooved, as is often also the case in G. nivalis. Slight longitudinal grooves on abaxialleaf surfaces. 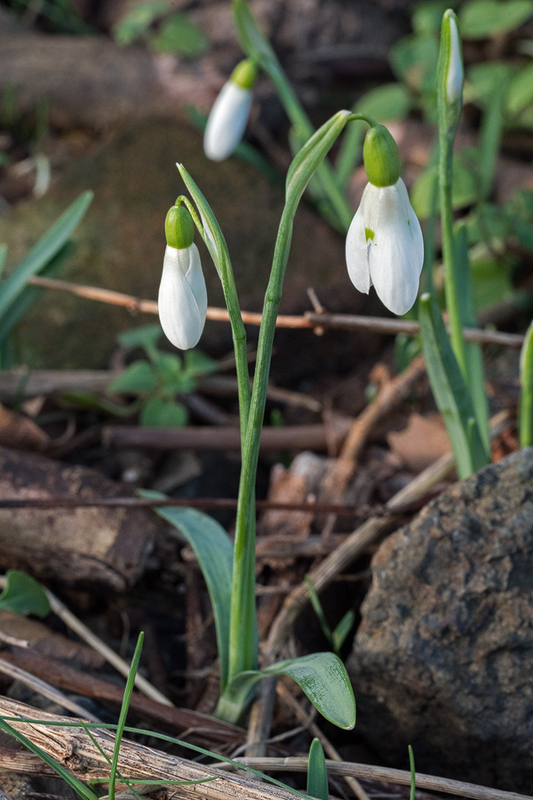 Galanthus samothracicus, Xiropotamos River, Samothraki, 19/1/16. 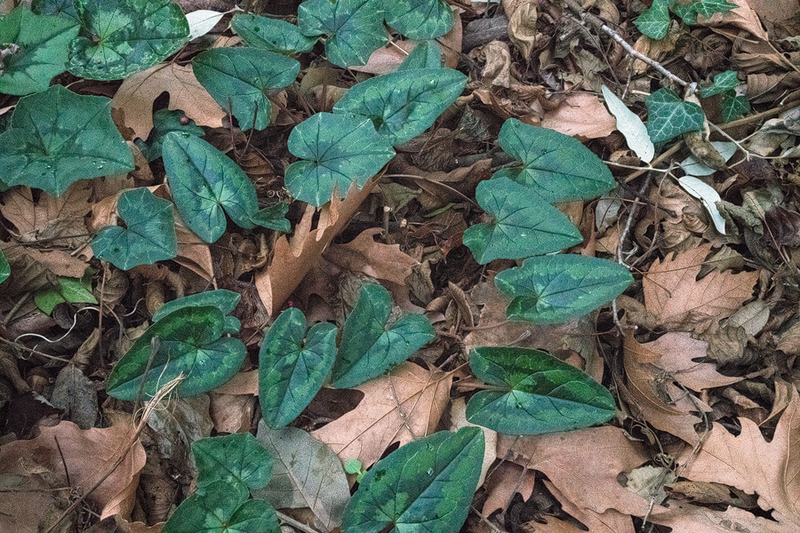 According to Tan et al., the leaves turn shiny green as they age, unlike G. nivalis, in which the leaves remain glaucescent. In some cases, the glaucous coating was already being abraded away. The leaves ranged in width from 5mm to 9mm and there was a noticeable difference between the populations near Ano Meria and Xiropotamos. The former were much narrower, typically being between 5mm and 6mm wide in the middle of the leaf. Those from Xiropotamos were typically 8mm to 9mm. Twin scapes. Note also glaucous surface abrasion. 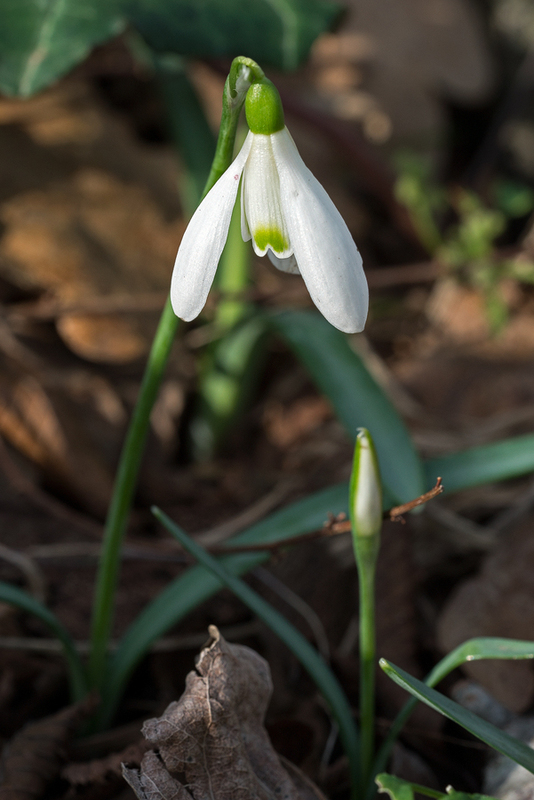 Galanthus samothracicus, near Ano Meria, Samothraki, 19/1/16. The outer segments had rather short claws in most cases, and were deeply concave, with bowed backs and quite elegant. Quite a few individuals showed a tendency for one of the segments to reflex and ‘fly away’, in the manner of the cultivar Galanthus nivalis ‘Egret’. Reflexed outer segment. 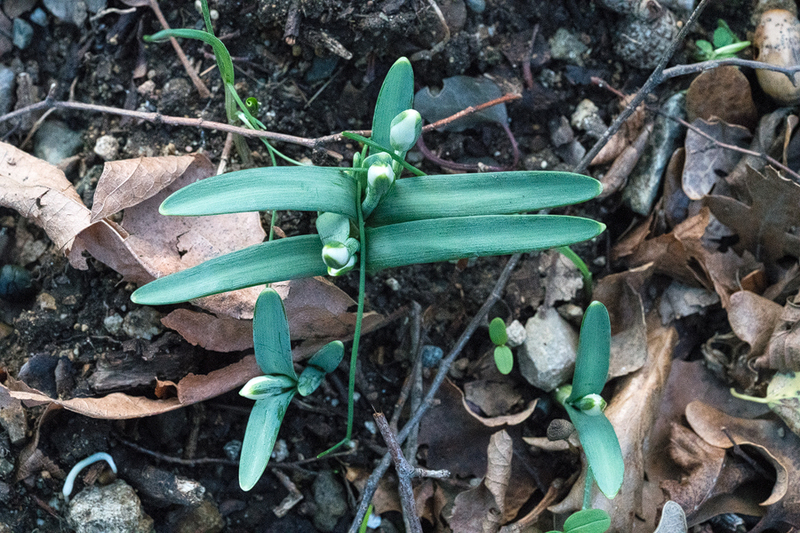 Galanthus samothracicus, near Ano Meria, Samothraki, 20/1/16. The inner segments, roughly triangular in shape, had a single green mark at the apex, with the green generally ‘bleeding’ slightly into the segment. In a few individuals the side margins and base of the segments also had a slight green tinge, but this was rare. The mark varied in shape from an inverted-U to a hump-backed bridge. In some cases the basal edge of the mark was more-or-less straight. The sinus (notch) at the apex of the inner segments was conspicuous. Too few flowers were fully open for me to gain a good impression of the variation in the shape of the markings but I noticed rather little variation, in comparison with other snowdrop populations. I should like to return on another occasion, later in the season, to examine more plants. Typical inner segment marking. 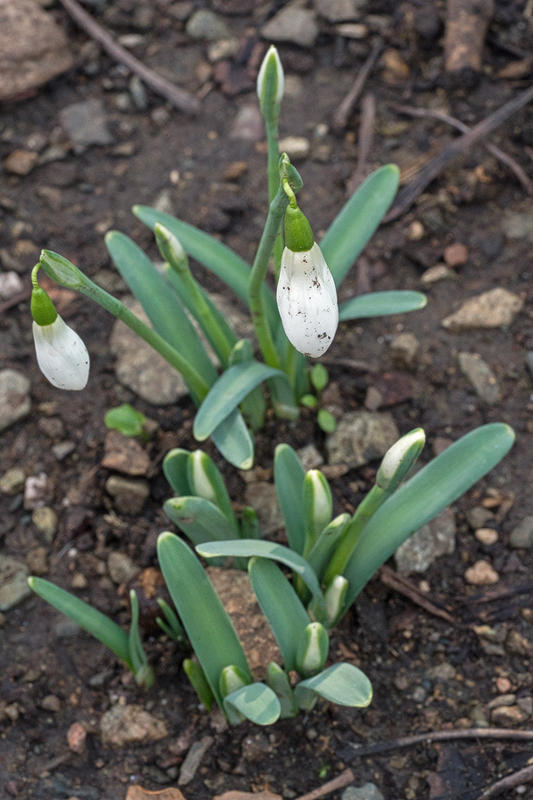 Galanthus samothracicus, near Ano Meria, Samothraki, 20/1/16. The plants were conspicuously clump-forming and many clones had built up into clumps containing dozens of bulbs. A relatively large number of plants had two scapes per bulb, a phenomenon I have not observed very frequently in G. nivalis. Twin scape plant. Galanthus samothracicus, near Ano Meria, Samothraki, 19/1/16. Is G. samothracicus a good species? I don’t know! 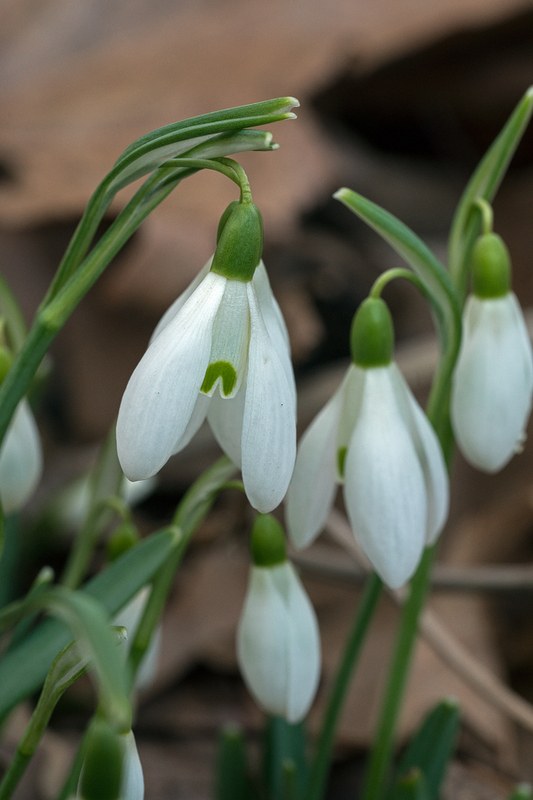 There are certainly subtle morphological differences between the snowdrops on Samothraki and the many, variable populations of G. nivalis I have seen, though it’s hard to put one’s finger on exactly what these are. Other evidence cited by Tan et al. (see below) is highly suggestive but I will be fascinated to see DNA sequencing results in due course. Discussion for galanthonerds of the status of G. samothracicus. Systematics, the business of classifying living organisms, is a profoundly provisional science. There are no truths to be found in its academic journals, only hypotheses. This is not a criticism. On the contrary, a defining feature of science is its willingness to abandon failed hypotheses when new ones, fitting the evidence better, come along. Plant systematists get a lot of stick from gardeners who don’t understand that taxonomy (the applying of names to organisms) must reflect systematics, unless we want our system of names for organisms to diverge slowly from our best understanding of the relationships among them. The goal of systematics has become, especially since the advent of technology enabling the rapid and cheap sequencing of large chunks of DNA, the elucidation of the evolutionary history of organisms. All organisms share a single common ancestor: we are all cousins, related however distantly. The implication of this profound biological fact is that there exists a single true, fabulously complex history of life on earth and it is the ambition of systematics to reconstruct this history – a phylogeny, in the jargon – using evidence available today. As organisms diverge, so differences in their DNA blueprints accumulate. By counting the number of differences in certain relatively short DNA sequences in closely related organisms, molecular phylogeneticists build up a hypothetical family tree of the group of organisms they are studying. There are many hazards involved in this approach. The sections of DNA chosen for analysis (with plants, two fragments are commonly sequenced, one from the cell’s nucleus, the other from its chloroplasts) may not have diverged in a manner that accurately reflects the evolution of the group. It is likely that the group’s evolutionary history, especially in plants, will not resemble a tree but rather a river delta, with lineages merging, though hybridisation events, as well as diverging in speciation, violating the assumptions of the analysis. Most systematists are well aware of these pitfalls and try to allow for them statistically but their conclusions are always tentative and always subject to revision, as more evidence comes to bear. 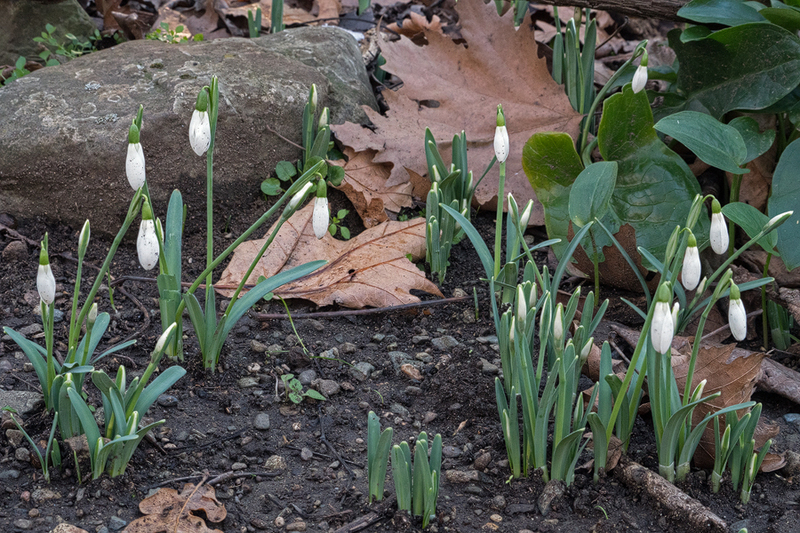 As the title of the most thorough recent analysis* of the relationships among Galanthus species puts it, snowdrops are ‘slowly falling into place’. 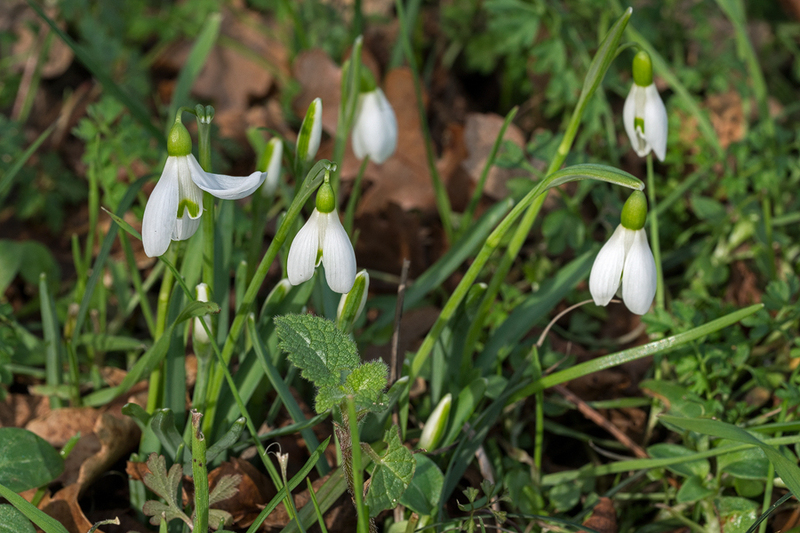 We now have a pretty convincing hypothesis, well supported by several complementary strands of evidence, for the general shape of Galanthus evolutionary history. But we need to remain humble and open to different interpretations of the data. Three species: G. nivalis, G. elwesii and its close cousin G. gracilis, all of which occur over wide ranges, are poorly understood and future research is likely to result in their rearrangement into several ‘new’ species, no doubt to howls of outrage from people who really liked the old names and want to preserve them. The opposite problem, when multiple names are coined for what turns out to be a single species, is more common or was, in the days before botanists had email. Of course, we remain lamentably ignorant about the number of species with which we share the earth and their distributions over its face. New species are being discovered and named all the time. Just as phylogenies are hypotheses, so are new species. A botanist publishes a name, with a description and some justification and awaits the verdict of her peers. Often there is disagreement, frequently obeying the dictum that disputes in the academy are often vicious because they are about matters of virtually no consequence. I do not think it is widely understood that the ‘validity’ of a species is a matter of consensus among botanists, not a question of biology. It’s very like English law, where the legal status of a particular thing is defined by the consensus among practicing judges. Unfortunately, in biology as in law, many of the judges really aren’t in a position to render a meaningful verdict and ought, therefore, to remain silent, but don’t. 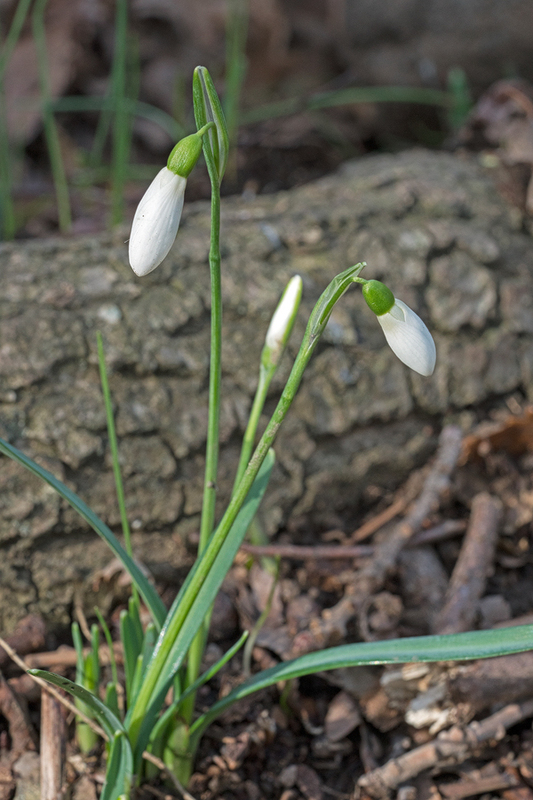 Which brings me, finally, to the main subject of this post, the recently described Galanthus samothracicus*. 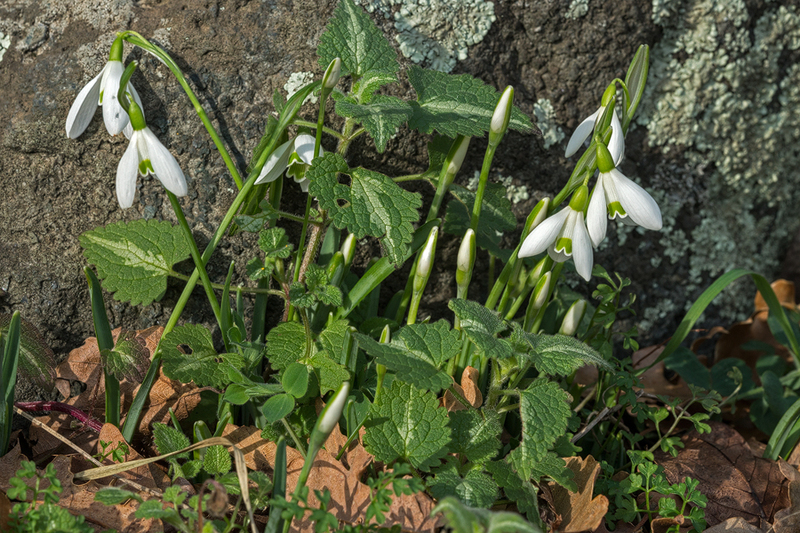 Several populations of snowdrops were found in 2006 by Burkhard Biel, growing at low elevation on the Greek island of Samothraki in the north east Aegean. Morphologically, these plants were similar to G. nivalis but with some subtle differences in leaf shape and flower markings. Individually, these differences were modest but they added up to something distinctive. In addition to these morphological differences, the plants on Samothraki have a considerably smaller genome size (the total amount, measured in picograms, of DNA in the cell nucleus) than G. nivalis. Comparisons were made with G. reginae-olgae and with G. x valentenei nothosubsp. subplicatus, the helpful name for natural hybrids between G. plicatus and, putatively, G. nivalis. The hybrids occur in Turkish Thrace. Intriguingly, the genome size of the Samothraki plants, about 52pg, suggests to me a resolution to the puzzle of the second parent of G. x valentenei. If the second parent were G. nivalis, one would expect a genome size for the hybrid of about 64pg, the average of G. plicatus (55.5pg) and G. nivalis (72pg). In fact, G x valentenei nothosubsp. subplicatus has a genome size of 54.4pg, which is neatly close to the average of G. plicatus and G. samothracicus. This hypothesis that G. samothracicus is a parent of G x valentenei nothosubsp. subplicatus is also biogeographically satisfying, especially if other populations of G. samothracicus are found on the Turkish island of Gökçeada and on the mainland of Turkish Thrace. Further research needed, as they say! The paper’s authors concluded that the Samothraki plants did not belong with any of the biogeographically plausible accepted species. For some reason, they regrettably did not consider G. gracilis (of the form that occurs in NE Greece) as a potential close relative. Morphology is often a poor guide to relatedness. For example, G. peshmenii and G. cilicicus are both close relatives of G. elwesii, despite much more closely resembling G. reginae-olgae and G. nivalis respectively. Unfortunately, no attempt was made to conduct a molecular phylogenetic analysis, which could provide convincing evidence of the plants’ affinities. Pending the results of such an analysis, I think we have to remain agnostic regarding the status and affinities of this fascinating snowdrop. 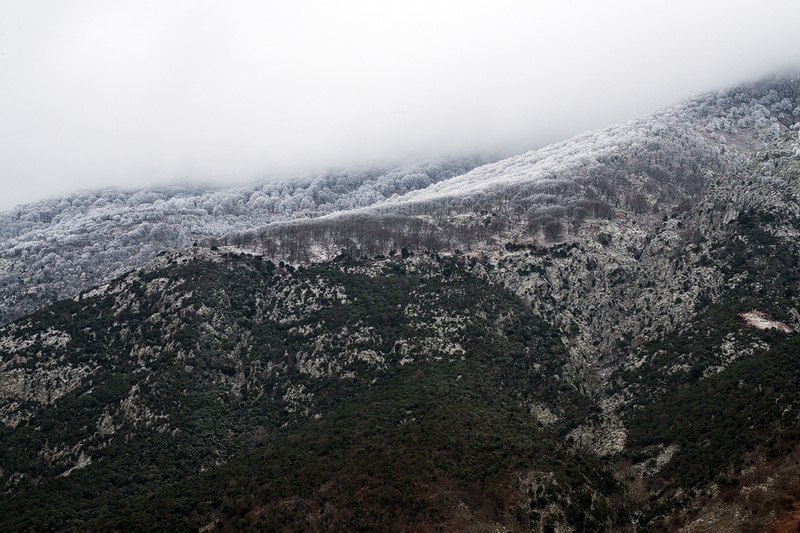 Frost and mist on the beautiful island of Samothraki, 18/1/16. * Tan, K., Biel, B. & Siljak-Yakovlev, S. (2014) Galanthus samothracicus (Amaryllidaceae) from the island of Samothraki, northeastern Greece. Phytologia Balcanica, 20(1): 65 – 70.